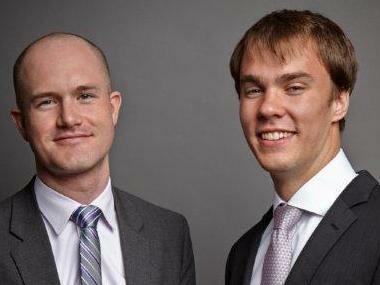 Coinbase co-founders Brian Armstrong (l) and Fred Ehrsam, sporting we-got-money grins. If you’re a bitcoin doubter, you might want to turn away. The doors to venture funding in bitcoin startups are about to swing wide open. Existing investors Union Square Ventures and Ribbit Capital will contribute some cash, as well. And Union Square’s Fred Wilson and Andreessen Horowitz’s Chris Dixon are taking seats on Coinbase’s board of directors. Coinbase currently employs only eight people, but will add significantly to that total. It may also start to buy advertising to promote itself and bitcoin. Bitcoin is often described as a digital currency and also as a payment network, though you can find people who say it behaves more like a commodity, or even a security. No matter what you call them, each bitcoin consists of a long digital string of characters, and the network consists of a decentralized sprawl of computers that approve transactions and solve increasingly complex math problems to create — or “mine” — new bitcoins. Coinbase plays a few roles in this ecosystem. It is best known as a so-called bitcoin wallet, which bitcoin owners use to store the digital currency in the cloud so they don’t have to worry about safeguarding it from, say, hackers, on their own computers. It says it currently holds more than 600,000 bitcoin wallets. The startup also helps people buy and sell bitcoins, working as an intermediary between individuals and bitcoin exchanges. It charges a one percent transaction fee for buying and selling bitcoins. Lastly, Coinbase helps businesses accept bitcoins as a payment method, and takes a one percent cut if a merchant wants to exchange the bitcoin for its local currency (the fee kicks in only after a merchant uses Coinbase to process $1 million in bitcoins.) Atlanta-based BitPay, backed by Founders Fund, is probably the best-known bitcoin payment processor right now. Over the last two months alone, the price of a bitcoin has soared from a little more than $100 to north of $1,000 (it was around $900 at the time I wrote this), boosted in some part by U.S. Senate hearings that took on a much more positive tone than many observers had expected. Along the way, media attention focused on the digital currency has intensified. Different people see different potential in bitcoin. Others see potential for the bitcoin network to become a competitor to companies such as Western Union, as a cheaper alternative to send funds to people overseas. There’s also a large group of people right now that view it strictly as a speculative bet — let’s buy it today, hope its value increases, and sell it for a profit down the line. Up to now, Coinbase has found that about 80 percent of its bitcoin wallet customers are viewing bitcoin as an investment, since they have simply been storing the currency, according to co-founder and CEO Brian Armstrong. But Armstrong and co-founder Fred Ehrsam are betting that in, say, five years, the use case will shift, and 80 percent will be using it for commerce. Either way, the currency still faces myriad questions. When will the drastic increases and dips in price stop? What’s to stop the price from crashing to the ground? As the number of bitcoins in circulation nears the maximum of 21 million, will its value soar? If so, will hoarding reign supreme? What’s the incentive for people to pay for products and services in bitcoins, especially while there’s the chance that a bitcoin worth $900 today could be worth $1,500 tomorrow? Will states regulate bitcoin businesses through bitcoin-specific licenses, as New York suggested it may, and will that spur or inhibit mainstream adoption? How will the earliest bitcoin community members, who built the currency in part on a foundation of anonymity, respond to an increasingly aggressive drive to link identity to bitcoin ownership? But Ehrsam admits that future government decisions around bitcoin in the U.S., while having the potential to boost the currency’s credibility, could also deal the ecosystem significant setbacks. Certain tax treatments, for example, could make the currency less attractive, he said. In reality, many of these questions won’t get answered anytime soon. But now, Coinbase has the cash to build a business for awhile, as some answers start to emerge. And its VC backers have placed an early bet in an incredibly young sector, on a company that is probably the best-known bitcoin consumer brand in the U.S.
That could mean nothing, should the bitcoin bubble burst as quickly as it has expanded. Or it could mean a whole lot, if some of bitcoin’s long-term potential comes to fruition.